This will be fun. 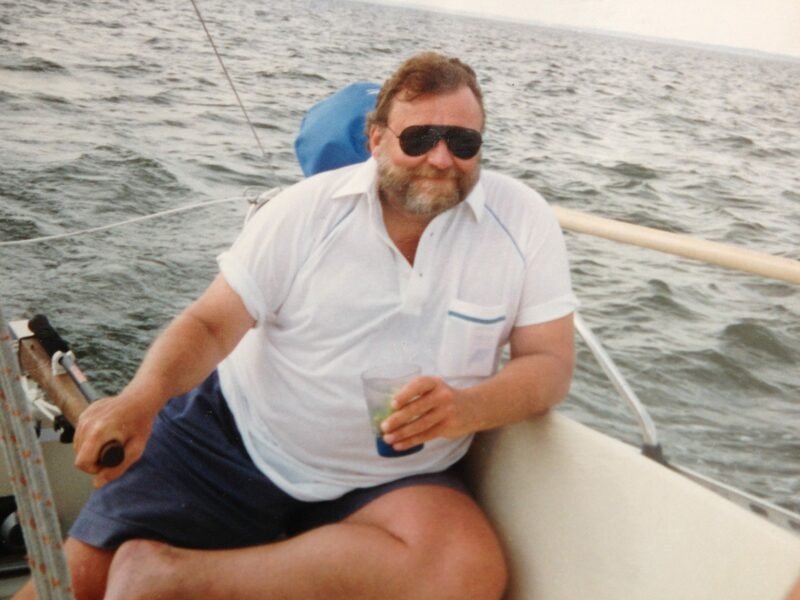 I have known Bill Ross since the mid 1980’s and we have spent many days on sailboats both large and small. He has been an integral part of the fabric of Alexandria in business, volunteering and charity work for the last thirty years. He has also been my friend. Born in Baltimore on August 24, 1950, Bill s pent his formative years in Baltimore graduating from Brooklyn Park High School, which closed its doors in 1990. In 1969 Bill enlisted in the U. S. Navy reaching the rank of Petty Officer before being discharged 4 years later. Returning to Maryland, Ross attended the University of Maryland where he graduated in 1976 with a degree in Advertising Design. His first job was in 1976 as an intern at WTTG, a local television station. Back in those days cable was in its infancy and there were only four television stations in the Washington D.C. market. In two years Ross was made Art Director of the station. In the 1970’s, WTTG was one of the leading independent stations in the country, running a broad lineup of cartoons, off-network sitcoms, first-run syndicated shows, older movies, local newscasts and locally produced programs. The most popular show, Panorama, was one of the first afternoon talk shows on TV. The show was hosted by John Willis, Maury Povich, and later by Ross’s friend Jackson Bain. Today, WTTG is one of Rupert Murdocks Fox stations. After leaving WTTG, Ross worked as general manager of various graphic companies in the Alexandria area. It was during this time that Ross met Bill Harris, founder and owner of Letter Com, one of Alexandria’s largest mail houses and printing businesses. Letter Com had no in house graphics production, and soon the two established a partnership and Letter Com Type was born. The profitable business lasted for 15 years, but with the popularity and accessibility of the personal computer, the graphics business began to change and Ross sold his shares back to Harris. It was during this time that I began to get to know Bill Ross. 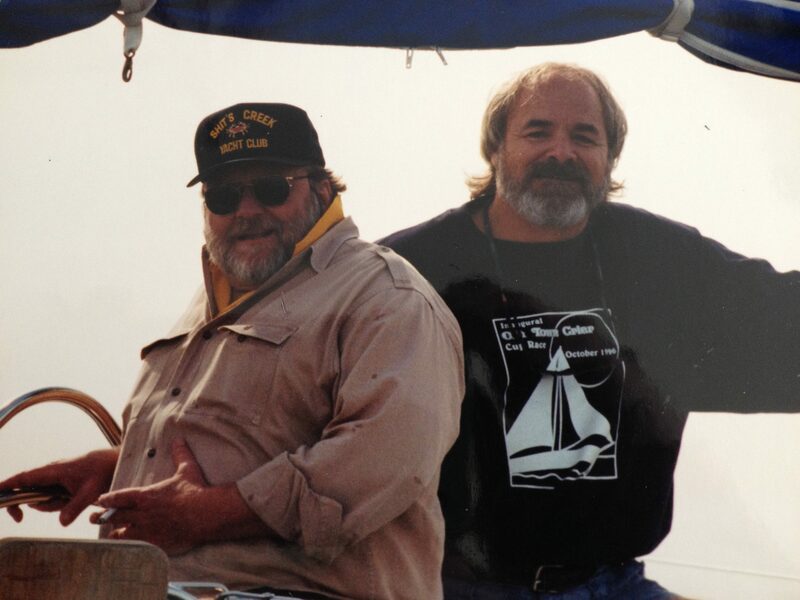 For 10 years the Old Town Crier sponsored the Old Town Crier Cup sailboat race, and Ross not only designed our t-shirts but also crewed on my boat in a number of those races. In 1989 he volunteered his time to serve on the board of directors of the Seaport Foundation, which was developing their successful boat building school, and was the custodian for the three -masted schooner, Alexandria. Ross got me involved with the Alexandria, which became the sailing ambassador for the City of Alexandria. We shared many wonderful trips on the 125-foot ship, which was built in Denmark in 1929. We sailed with Captains Pete Hall and Chip Reynolds, and the friendships that developed helped Ross to decide to work toward his own captains’ license, which he achieved in 2004. While pursuing his captains’ license he worked as a deckhand on some of the boats from Potomac River Boat Company (PRBC) to satisfy his time on the water requirement. 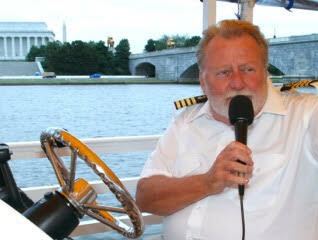 After he received his captains’ license he then served as captain on the same boats for PRBC. About 12 years ago I introduced Ross to a friend of mine who owned and operated a tour boat out of Georgetown. Clayton needed a part-time captain to give him some days off. The two captains hit it off and in two years Ross bought the boat and business. Soon after, Ross sold the smaller boat and replaced it with a 45-foot pontoon boat, the George Washington, that can carry 42 passengers. 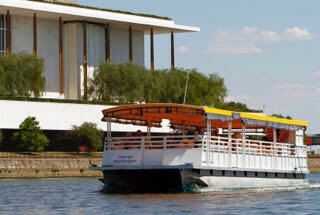 His business – National River Tours – runs from April to October 7 days a week and is available for private charters. In the mid 90’s Ross met a young lady who would later become his wife. Caroline Bruder was a successful chef who was executive chef at such places as Café Milano, Isabella, Bistro Bis, La Bergerie and worked with Chef Cathal Armstrong at Old Town’s Restaurant Eve. During one of the Great Chesapeake Bay Schooner races that Ross was running, Ross convinced Caroline to sail along and act as chef for the crew. The race started in Baltimore and ended in Norfolk and lasted three days…then you had to come back. Well, that provide for a long time together in that race in 1997 and in 1998 they were married. Caroline had always wanted to have her own restaurant and the two of them began casting an eye to the old Village Wharf restaurant in Hollin Hall. As he was driving by one night in 2010 he noticed that the light was no longer on and began to investigate the next day. He wrote a proposal to the landlord and the proposal was accepted. After raising capital and going back and forth with zoning and the rest of the red tape with Fairfax County, they finally opened River Bend Bistro together in 2014. Caroline knows the kitchen and the wines and Ross is the business end of not just his tour boat, but also the restaurant. For a sailor who would much rather be at the helm of a sailboat with a boat drink in his hand, this young mid-60ish year old has embarked instead on two new careers. He is captain of both of these ventures, but at least with the restaurant he has a first mate that actually works as hard, or harder than he does.